The largest city in the Pacific Northwest, Seattle is a great place to live and visit. With Puget Sound on one side and Mount Rainier on the other, Seattle is all about natural beauty. If you'd like to beautify your property in a way that blends nicely with the surroundings, stamped concrete is a great option. Whether you install a stamped driveway, patio pool deck or other surface, you'll be happy with the realistic colors and textures that mimic natural materials found in the Seattle area. 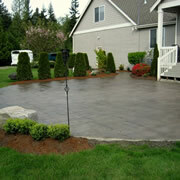 Here is a list of concrete contractors in Seattle. 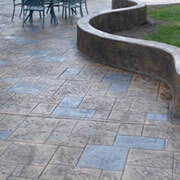 One of the best things about stamped concrete is that it can be colored in nearly any shade imaginable. However, in Seattle earth tones are popular because they are most realistic and blend well with a variety of architectural styles. Browns and tans are the most common stamped concrete colors in the area, with gray and terra cotta following close behind. Stamping contractors in the Seattle area will be able to help you select a color, many will even do a mock up so you can be sure of your decision. When picking a color for your stamped patio or driveway, consider the existing color scheme of your home's exterior. You can either match a color as closely as possible or pick something that contrasts nicely. Keep in mind that multiple colors and application techniques can be combined to create the perfect shade. 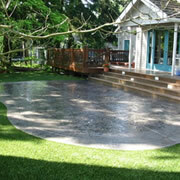 Another way stamped concrete can be customized is with various patterns. There are a number of options available that mimic brick, slate, flagstone, stone, tile and even wood. You can choose from stamps that look like they have grout lines or seamless texture skins that impart consistent texture across an entire area. Many people in Seattle pick seamless texture skins because they help areas appear larger and more open, which is nice when you're in the city and limited on space. Some people combine multiple patterns for a unique look, while others use stamped concrete in conjunction with other decorative treatments such as exposed aggregate.